Holland America' first Noordam -- there were three, all told -- was built by Harland & Wolff of Belfast. Launched in September 1901, she made her maiden voyage from Rotterdam to New York on 1 May. 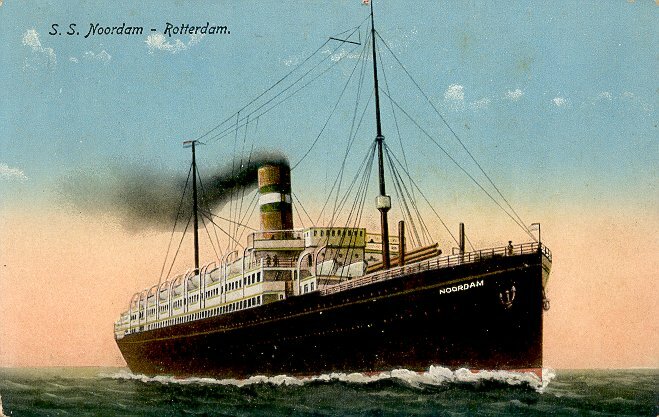 From August to October 1914, the early months of World War I, she made a few commercial voyages, but after striking a mine in the North Sea on 17 October, Noordam spent the winter in Rotterdam. She returned to service 26 March 1915, one of the few liners to maintain regular service from the continent during the war. She struck another mine, though, off Terschelling Bank in August 1917 and did not return to service; instead, she spent the rest of the war in layup at Rotterdam. Noordam returned to service with a March 1919 trip on her prewar Rotterdam-New York route. From March 1923 until November 1924, during the refit of Swedish American's Drottningholm, Noordam was chartered to Swedish American for service on that line's Gothenburg-New York route, and was renamed Kungsholm. Noordam returned to service for Holland America in October 1926 and made her final voyage in April 1927. She was scrapped the following year. Sources: Bonsor's North Atlantic Seaway; Haws' Merchant Fleets; Kohler's The Holland American Line; Moss and Hume's Shipbuilders to the World.